Driving is often something we take for granted. When we hop in our car and turn the key, it’s expected that the will engine turn over and we’ll get to our destination without any problems. Unfortunately, this isn’t always the case. Over the course of your lifetime, it’s almost guaranteed that you will experience a car breakdown – it’s just a matter of when. The next time your car breaks down on the side of the road, will you be prepared? The first step in preparing for a car breakdown is learning how you could prevent the situation in the first place. Faulty batteries are the culprit for many breakdowns, so make sure yours is tested regularly and that you never leave any lights on while the engine is turned off. Damaged tires are another common cause of breakdowns. Overused, worn down tires have a higher chance of blowing out, leaving you stranded on the side of the road. Tires should be replaced every 25,000 to 50,000 miles, depending on how often you drive. Other causes could be alternator faults, fuel problems, starter issues, faulty spark plugs and issues with high-tension leads. Many of these issues can be avoided with regular car maintenance. Even when taking all of the proper precautions, there is still a possibility of breaking down. It’s important to keep a fully stocked breakdown kit in your car. This kit should have everything you need to properly handle a breakdown when it occurs. It should contain a first-aid kit, a flashlight, a mobile phone charger, a car jack, spare tires, and a tow rope. For extra safety and protection, it is also a good idea to carry a road atlas, high visibility vest, hazard triangles, as well as a bottle of water and non-perishable food like granola bars. These items will prepare you for a myriad of issues that could come up. Once your car breaks down, you’ll need someone to take care of the issue or tow you to a repair shop. It’s important to have a trusted towing company on deck to provide roadside assistance. Put an experienced towing company’s phone number into your mobile phone and keep a note with the number in your car breakdown kit. This will reduce the panic of being stuck on the side of the road – you always know there is someone out there to help. After a car breakdown, you need to immediately take control of the situation. This assessing the situation to see if everyone is safe. Look for the safest place to pull over – as far away from traffic as possible. Next, turn on your hazard lights and turn the car off. Now is the time to contact roadside assistance and anyone who may be waiting on you. Place hazard triangles in front of and behind your vehicle if you can do so safely. Finally, wait in your car until roadside assistance shows up. When your car breaks down, chances are you will be stressed or even a bit scared. It’s important to take a moment to relax and take a deep breath. This will help you regain your thoughts and take the proper roadside precautions. 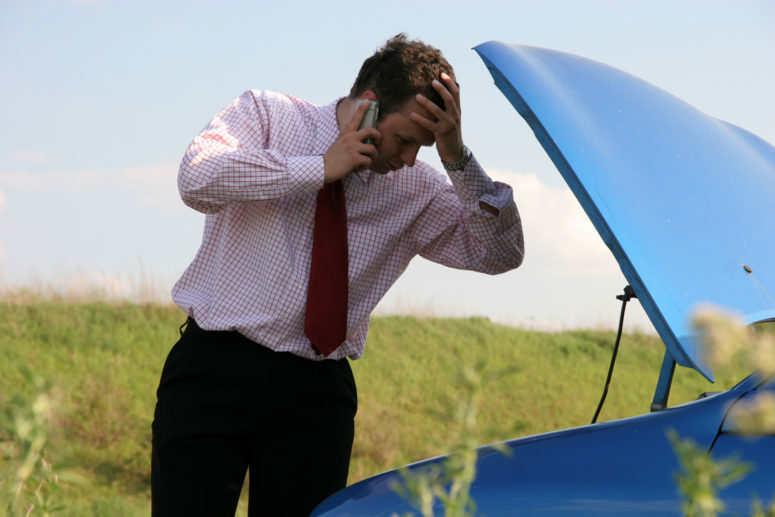 Don’t worry, roadside assistance will know how to help and you will be driving again in no time.